Organisations that suffer a major crisis have more than a one in four chance of going out of business. Yet despite this level of risk, many companies continue to leave crisis management in the hands of operational middle managers or inexperienced technicians. Corporate crisis management traditionally has a strong emphasis on tactical elements such as crisis manuals, cross-functional teams, table-top simulations, communications procedures and a well-equipped ‘war room.’ However, leading companies are now taking a more proactive role in crisis planning and issue management, shifting from reactive crisis response to proactive crisis prevention, and moving the focus from the war room to the board room. But progress is slow. A global survey of board members, published in early 2016, found that fewer than half of the non-executive directors questioned reported they had engaged with management to understand what was being done to support crisis preparedness. And only half the boards had undertaken specific discussion with management about crisis prevention. Moreover, fewer than half of the respondents believed their organisations had the capabilities or processes needed to meet a crisis with the best possible outcome. The reality is that many organisations still fail to prepare properly and continue to treat crisis management as an operationalised part of the emergency or security function. That may provide an adequate response to an incident when it happens, but contributes nothing to crisis prevention, long-term value, or reputation management. The other key factor driving increasing senior executive involvement has been the acknowledgment that most crises which threaten a company are not sudden, unexpected events, but are preceded by clear warning signals, which are frequently ignored. In fact, the Institute for Crisis Management in Denver, Colorado, which has been tracking business crises in the media for well over 20 years, concludes that about two thirds of crises are not unexpected at all, but are what they categorise as ‘smouldering crises’ – events which should have and could have prompted prior intervention (and more than half of all corporate crises are in fact caused by management). 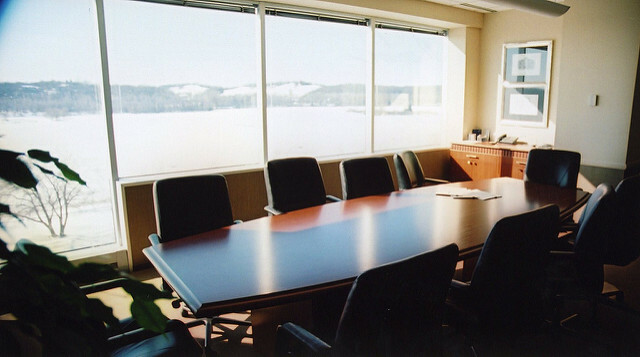 Board Room by Benjamin Child. Public domain via Unsplash. Together these two factors – that most crises are not truly unexpected and that many are avoidable – have fueled the move from the operational emergency context of the war room to strategic planning in the board room. This evolution towards strategic recognition and prevention rather than tactical response has in turn expanded the crisis management role of top executives and directors. However it has also exposed a practical challenge. Most managers want to do what’s right for their organisation. Yet some struggle with deciding exactly what needs to be done to protect against the reputational and organisational damage threatened by a crisis or major public issue. Many directors and senior executives would prefer not to think about crises, so participation in crisis management does not always sell well at the top. But every top manager should be concerned with preventing crises and protecting the company’s reputation. Providing leadership, expertise, experience, and support in the event of a real crisis. Developing a genuine crisis prevention approach, instead of focusing on crisis response, gives senior executives the responsibility to protect the organization and prevent crises from the top. A version of this post originally appeared on the Oxford Australia Blog. Featured image credit: Architecture blue building by PublicDomain Pictures. Public domain via Pixabay. Tony Jaques is a consultant specializing in issue and crisis management, and lectures at RMIT and Swinburne University. He is also the Managing Director of Issue Outcomes P/L. 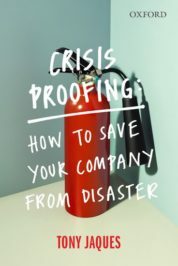 He is the author of Crisis Proofing: How to Save Your Company from Disaster (OUP 2016) and Issues and Crisis Management: Exploring Issues, Crises, Risk and Reputation (OUP 2014).